The Packer Ranter: No real analysis, but at least we're pretty. : Duct, Duct, Gift. It's sitting there. Under the tree. Resting next to the four-pack of argyle socks and seasons one and two of MacGyver. The bright yellow surface reflecting the twinkling lights, a couple spruce needles stuck to the edge. It had been tucked in the bottom of my stocking, a stocking that had gotten buried under wrapping paper, boxes and half-popped bubble wrap. As numerous Hillside cousins, nieces, nephews, dogs and two random neighbor kids abandoned their gifts to play with the wadded up wrapping paper and discarded ribbons, the stocking appeared. I picked it up to rehang it on the mantle and felt the cylindrical object jammed in the toe, a yuletide toe jam if you will. I reached in the stocking and pulled out the small item and admired the Peanuts wrapping paper. That tree really did just need a little love. I slowly unwrapped the last gift of the 2012 Christmas season and not much could have prepared me for what was enclosed by Charlie Brown, Linus and Lucy standing around their little tree. I couldn't have been more surprised if I woke up with my head sewn to the carpet, Eddie. In my hand I held what I initially thought was a Green Bay Packers hockey puck, but as I turned the item over in my hands, I realized I was the new owner of a roll of Green Bay Packers' duct tape. I glanced around wondering who had given me this offering, but none of the Hillside clan seemed to be paying attention...which was fairly typical. I realized that this was the only piece of Packers paraphernalia I had received this year, which may have a been a sign from my family that I have reached green and gold capacity. I said, "thank you," to no one in particular, thinking someone would respond, and I could ask how they intended for me to use this Packers adorned duct tape. Unfortunately, kids went right on playing, dogs went on chasing each other around the tree, and adults went right on spreading good cheer next to the egg nog bowl. I flipped up the roll, caught it, and placed it under the tree. Two days later, I still have not found out who had given me this gift. Resigning myself to the belief that it may have actually been Santa who inserted this into my stocking, I've moved on to finding uses for it. I'm fully aware that there are hundreds, if not thousands of uses for duct tape, but when you put the "G" on anything, be it shirts, socks, spatulas, garden gnomes, long johns, bathroom rugs, you have a responsibility to conduct yourself in a manner befitting the Packers' organization when using said item. Green Bay Packers duct tape cannot just be applied anywhere. There are rules. It must have a utilitarian purpose, but it must also be used in a decorative and boasting manner. It must be in full view of others, Packer fans and heathens alike, but it must not draw attention to some sort of embarrassing mishap like a pair of split trousers (Yes, I have witnessed torn trousers "fixed" with duct tape, don't pretend you haven't). So you see, this isn't just an easy stocking stuffer gift, this is a thought-provoking item, and it must be used pridefully, but also prudently and with respect. As Hillsides slowly remove their presents from under the tree and make their way back to their hillsides of origin, I continue to ponder this Packers' duct tape usage. Then it occurred to me, there's nothing better than a gift that makes you think. Maybe that was Santa's intent the whole time. 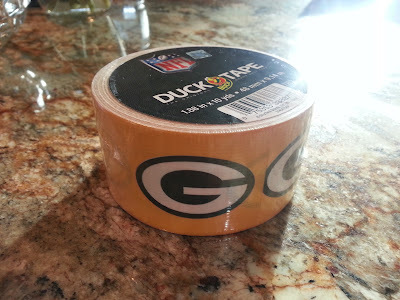 PS - If anyone else received Packers' duct tape, let me know how you intend to use it. Unfortunately, I don't think it will repair your broken dreams of becoming a roadie for Def Leopard, it's not magic. Sorry. Sweet Jesus! I though I was the only one who had been given such a gift. You are wise not to waste it on trivial matters. Packer duct tape is meant to repair national monuments or save small children, not to hold up the bumper on your crappy 1970 AMC Gremlin. Keep it safe. Trust that when the time comes, you will know how to use it. Think what MacGyver could have done with a rubber band, paper clip, AND a roll of Packer duct tape. Probably still be on the air. Me too!! I love my new duct tape!! Way out her in CA we cheeseheads have to represent!!! I plan on using it for....something special. Until then, I will just look at it and smile...so many possibilities! !